All learning is social and emotional and every opportunity is ripe for social and emotional skill development. We use an early and comprehensive approach grounded in the principles of positive youth development and evidence-based social emotional learning practices to foster the mindsets, skills, and confidence within each child to behave well, make good decisions, and build healthy relationships – skills necessary for success in school and life. Our approach provides a unique depth of implicit and explicit teaching by weaving social emotional learning throughout the program time or school day. A culture where social emotional learning can thrive is one that provides a safe and healthy place for children to learn and grow. This is critical for any social emotional learning initiative and is a significant contributor to the quality of learning that can take place. When you walk into a WINGS program there is an unmistakable energy, we call it a vibe. We want children to feel like WINGS is their home away from home, a place where they belong, feel safe, and wholly cared for. 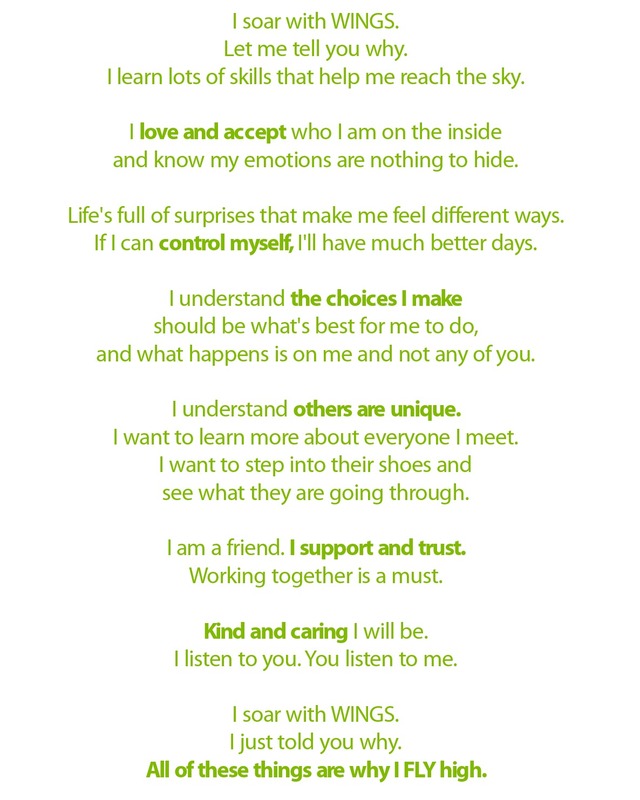 WINGS is a safe place for kids to learn how to take responsibility for their choices and actions, manage their emotions, and deal with conflict. In this supportive and engaging environment kids identify their strengths and weaknesses, feel empowered, and are fully engaged. To effectively teach social emotional skills, you must first possess your own social emotional skills. Adults who model emotional intelligence provide the critical foundation for trusting and positive relationships to be formed. When adults are skilled in the core social emotional competencies, they are supportive and engaging, take responsibility for their choices and actions, manage their emotions, deal with conflicts, and are open to feedback. It’s only when the adults possess strong social emotional competencies and fully embrace the WINGS Way of teaching that kids soar. At WINGS we teach more by our actions than by our words. Extensive training helps staff develop their own emotional intelligence and social emotional skills. Everyone that works at WINGS completes a full week of social emotional focused professional development every year as well as four shorter training sessions throughout the year. Our front-line program staff who work at our WINGS Afterschool sites receive an additional two weeks each year before the school year begins. We model social emotional skills in the way we engage with youth and in the way we interact with our peers – we call it Letting Your WINGS Out. When you are learning and living with your “WINGS Out” you are: aware of your emotions; able to deal with life’s surprises; responsible for your choices and actions; respectful of different perspectives; supportive and trustworthy; and kind and caring. A comprehensive curriculum provides explicit and implicit skill building opportunities across all of the five core competencies: self-awareness, self-management, responsible decision making, social awareness, and relationship skills. A comprehensive approach helps kids gain confidence, self-control, and empowers them to be problem solvers and make positive choices. At WINGS, all learning is social and emotional and every opportunity is ripe for social and emotional skill development. We make learning fun through kid-friendly language, lessons, and activities that are woven seamlessly throughout the program time. Our evidence-based curriculum is made up of ten learning objectives, two objectives for each of the five competencies, supported by corresponding lessons, activities, and games. The objectives and lessons are reinforced in small teachable moments that occur throughout the day, everyday, to apply the lessons in real-time. “I Soar with WINGS!” is the foundation for everything we say, do, and teach in our programs – providing a common language that staff and kids alike can relate to. Each phrase, a mini-lesson in itself, summarizes one of the five core competencies in kid-friendly language that can be used to guide behavior, choices, interactions with others, and responses to life’s circumstances. Each day our programs start with these words to live by – recited together by the youngest of kindergartners to the most seasoned of teachers. "WINGS helped me feel good about people and myself." In this video, hear from WINGS Leaders, alumni, students, parents and teachers about the tremendous impact our afterschool program has on the lives of those involved. Mix a supportive environment, caring adults, and social-emotional smarts, and you grow wings to fly.